Outline: Jesus' teaching has authority. Some of Jesus' teachings from the Bible. Story of the prodigal son. We have sinned. Jesus will welcome us if we forsake sin and come to Him. When Jesus Christ began His ministry (work) He began teaching the people how to live to please God. There have been many teachers and holy men in the world but there has never been a teacher or holy man like Jesus Christ. Jesus Christ, God's Son spoke with authority and power. He taught people how to live righteously and He Himself lived a perfectly righteous life. That is why His teaching has authority. He obeyed God's Word perfectly. Jesus Christ did only the things that pleased God. One day Jesus Christ was sitting on the hillside and teaching the people. There were many people gathered around Him listening to His teaching. As He was teaching He said to them, "You have heard the commandment that says, `You shall not murder.' But I am telling you that if anyone hates his brother and is angry with his brother without reason then God will punish (judge) that man also." That's what Jesus Christ said. The eye of man can see what other men do, but the eye of God sees what men think and desire in their hearts. God only judges man for what he does but also for what he thinks and desires in his heart. Jesus Christ also said to the people, "You have heard the commandment, `You shall not commit adultery. But I am telling you that if anyone looks at a woman and thinks lustfully about her then he has already committed adultery with that woman in his heart." God surely looks at man's heart, not just at what he does. What a holy, all-knowing God He is! But how can we come to God with a clean heart? We have disobeyed God's commands by what we have done and much more by what we have thought. We ourselves are not able to make our hearts clean, but God is able to do this. God is able to cleanse our hearts and give us new thoughts and new desires that will be good and pleasing to Him. As Jesus Christ was again teaching the people at a different time He told them a story. 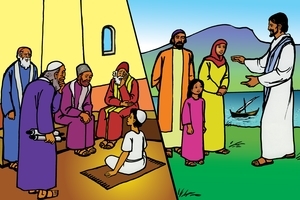 He told them this story to show how much God rejoices over a person who turns from his sinful ways and comes to believe in the true God. Jesus Christ said, "There was a certain man who had two sons. The younger son said to his father, "Father, give me my share of your inheritance.' So the father divided the inheritance and gave the younger son his share. A few days later the younger son sold all his possessions and taking the money he went away to a far country. There in that far country he wasted his money in foolish living. After he had spent all that he had a famine came to that land. The younger son became poor and hungry. He went to work for a man of that land and the man sent him into the fields to feed the pigs. The younger son became so hungry that he even wanted to eat the food he was giving to the pigs but no one gave him anything. Finally he said to himself, `Even my father's servants are well fed and here I am about to starve with hunger. I will leave this place and return to my father. I will tell him, `Father, I have sinned against God and against you and I don't deserve to be called your son any longer. Please let me just be as one of your servants.' Thinking this, the younger son left that far country and returned home to his father. While he was still a long way down the road the son's father saw him. The father ran down the road to meet his son and with great compassion and joy he hugged his son and welcomed him home. The younger son knew how he had wasted his money in foolish living and he said with shame, `Father, I have sinned against God and against you and I don't deserve to be called your son any longer. Please let me just be as one of your servants.' But the father said to his servants, 'Come, bring the best robe and put it on my son. Put a ring on his hand and new shoes on his feet. Go and prepare a feast, let us eat and rejoice together. For this my son was dead and is alive again; he was lost and is found.' "
Jesus Christ told this story to show how much God loves us. Anyone who forsakes (turns from, leaves, repents from) his sin and comes to God's Son Jesus Christ with all his heart will find that God welcomes him with love and joy and forgiveness, just as this father welcomed his wayward son back home. GRN has recorded a version of this script in 89 languages and dialects. See full list.